Alphamatician datasets cover numerous aspects of company performance. These include consumer engagement, demand, pricing, and company internals. We also offer macro level data. Alphamatician makes vast amounts of publicly available data useful in order to make decisions about markets, companies and products. We take the work out of data collection and management so that you can focus on generating alpha and on making better decisions. Please contact us for a full list. We track social media statistics for thousands of companies. This includes metrics such as "likes" and "followers. Platforms include Twitter, Facebook, Pinterest, Instagram, and YouTube. We monitor hiring activity for thousands of public and private companies. This rich and flexible dataset includes job counts, job titles, job locations, and more. See trends in pricing, demand, market share, and consumer ratings for companies, brands and products. We track reviews and complaints for thousands of companies and products. Our software adoption database offers software adoption and applications deployed for more than 15,000 companies. We monitor company mobile apps for thousands of companies. We collect data from numerous government data sources and map those datasets to individual entities. Access North American real estate data and statistics. These are a few examples of Alphamatician datasets. We offer hundreds of data series, covering thousands of companies. 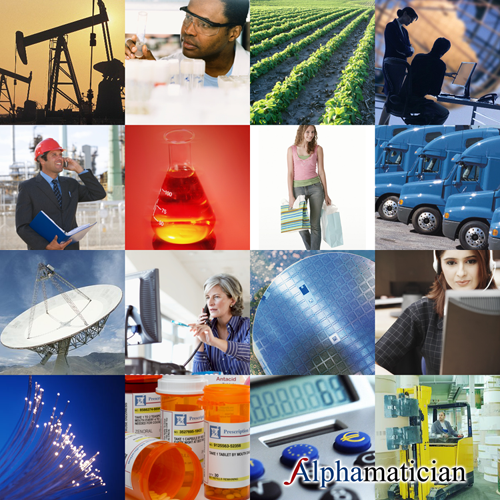 Please contact us for a more complete list or to learn more about Alphamatician products and services. Alphamatician makes the process easy. We provide an easy to use graphical user interface and multiple options to access data. We take the work out of data collection and management so that you can focus on generating alpha and on making better decisions. Alphamatician provides well cleaned data backed by multiple processes to help ensure a high level of data integrity. Alphamatician delivers the data you want in formats you can use. We work closely with clients to ensure that the data series we are providing meet precise needs. We cover more than 12,000 publicly traded companies and thousands more private companies across the globe. Our deep coverage includes industries, companies, and individual brands. We also cover macroeconomic data. We offer numerous datasets that give you insights into customer engagement and demand, pricing, company outlook, macro economic factors, and more. We offer numerous data series with more than three years of history. All of our data is provided mapped to individual company identifiers and tickers. We also offer custom entity mapping. Work with us in the way that best fits your own work flow. We offer interactive web tools, a flexible API and custom options. We collect, manage, and perform entity mappings for datasets that you specify. We also work interactively with clients to discover and explore new datasets. Social Signals℠ is a service mark and trademark of Alphamatcian LLC.